Ever since A and I moved into our new apartment, both A and I wanted a piano. A wanted an old rusty one to fix up, so he then could play on it and I, well let’s just say, I love pretend playing. So we both started looking for pianos, that would fit into our apartment, our ideas and our budget. A happily agreed, just looking, not taking. As we stood in front of the piano, checking out its’ cosmetic damages, all the good intentions and the agreement went out the window. How could I say no to A, when looking at me with puppy blue eyes, begging for us to take the piano home. The piano itself was lifted on two sets of axels that were not connected to each other. In order to steer it, you had to kick the front wheels like ever minute or so. It didn’t seem to be the best idea we ever had, but since we didn’t have to take public transport to get home, it didn’t seem like the worst idea either. So I agreed. We came to regret that decision rather quickly. Only about half a mile down the road one of the axels broke and there was no way we could move the piano with just two small wheels. So we had to make a choice, either abandon the piano and pretend to not ever have been there, or getting the cart from A’s work and trying to get the piano out of the cold as quick as possible. So yes, we opted for number two. While I waited with the piano in the freezing cold, and it really was below freezing, since that was the first day that it snowed in Oslo, A ran as fast as he could to his work, across the town, and got the cart. I must have waited about an hour and a half, jumping up and down, playing a few notes on the piano, singing to my made-up songs and whisteling, of course only whenever no one was close by, and hoping for A to get back soon. I should also mention, that the entire way up to where the piano was first located, was uphill. The way down seemed easy, what can go wrong, if we let gravity do it’s work? A few things, actually, like crossing a street. 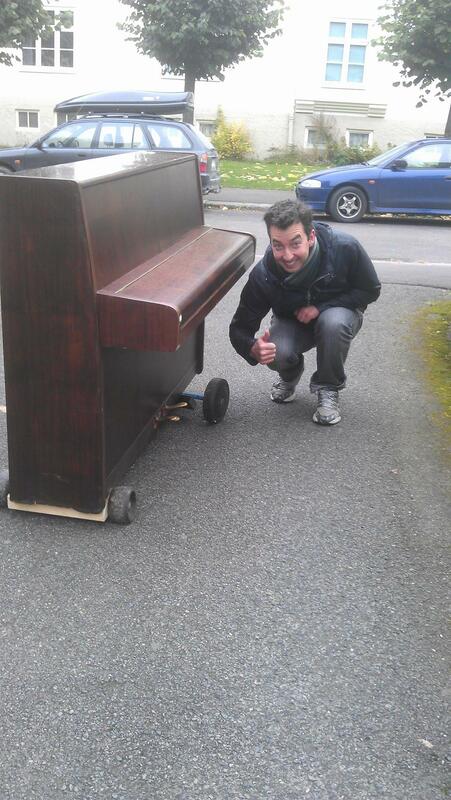 Have you ever crossed a street with a piano? Well, I have and let’s just say Bruno Mars makes it look much easier in his song than it looks like. Somehow, in the freezing cold while snowing and raining, we managed to lift the piano onto the cart, which led to several bruised on my arms and legs but that’s despite the point, at least it was easily movable now and from then on, it was rather smooth sailing. That is, until we got to our front door. We do live on the first floor, so thankfully there are no several flights of stairs that the piano needed to be lifted up BUT there are three small steps and with a super heavy piano and two-not-so-strong-people that was the true challenge. It took a lot of yelling (hiiiigher, hiiiigher, no you have to lift HIIIIGHER… thanks A, I will work on that, the next time), a lot of tears (whyyyy did we ever decide to do this, whyyy???) and many more bruises until we finally got the piano inside. A is currently working on fixing it and I am sure our neighbors appreciate the constant playing of the same note, just to get the right tune, but I believe that’s only a small price for them to pay compaired to what we had to go through just getting the piano inside in the first place. I honestly can’t say that we have learned our lesson with moving bulky stuff yet, it might have been the last episode (I really do hope so) but it also might have not. And since right now, neither A nor I have any other moving projects coming up, I will sit back and say, play it again, Sam.